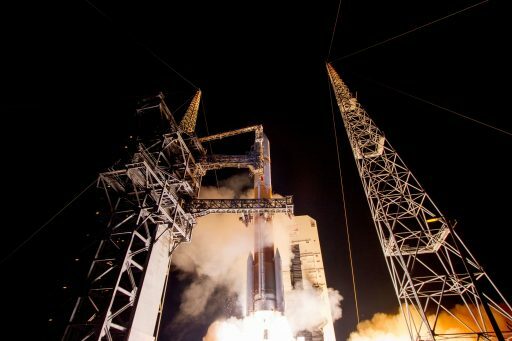 A Delta IV rocket thundered away from Florida’s Cape Canaveral after sunset on Saturday, blazing into the night with a powerful communications satellite for the U.S. and allied nations, joining the Wideband Global Satcom fleet that handles the bulk of secure, high-bandwidth communications for the U.S. military. The 66-meter tall rocket blasted off from Space Launch Complex 37B at 8:18 p.m. local time, 0:18 UTC on Sunday after an expected twilight liftoff turned into a night launch due to a last-minute hold extension required in the countdown to resolve a ground hardware issue. Powering away from the Cape with its four Solid Rocket Boosters and the world’s most powerful cryogenic engine, Delta IV quickly built up steam, pushing through the sound barrier half a minute after liftoff. 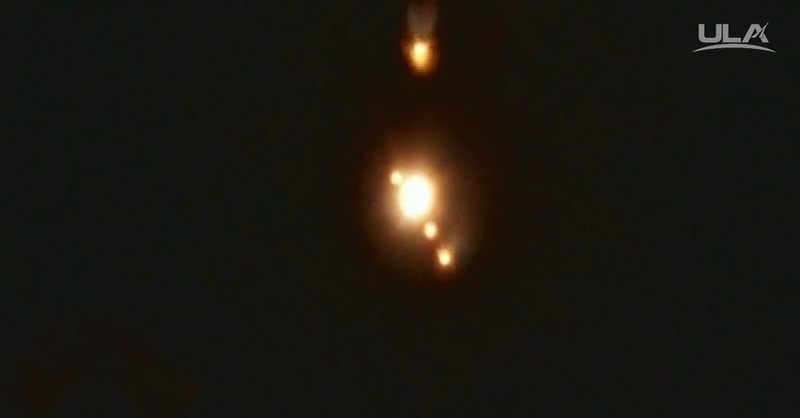 The four boosters dropped away one and a half minutes into the flight while the RS-68A core stage engine continued firing until the T+4-minute mark, handing off to the RL-10B-powered cryogenic upper stage for a pair of burns. The upper stage first pushed the stack into an elliptical parking orbit before firing up again half an hour after liftoff for the final boost into a highly elliptical orbit peaking over 44,000 Kilometers in altitude. The ninth Wideband Global Satcom satellite drifted away from the booster 42 minutes after its post-sunset liftoff, embarking on a 14-year mission supporting high-bandwidth communications to keep troops across the planet connected. 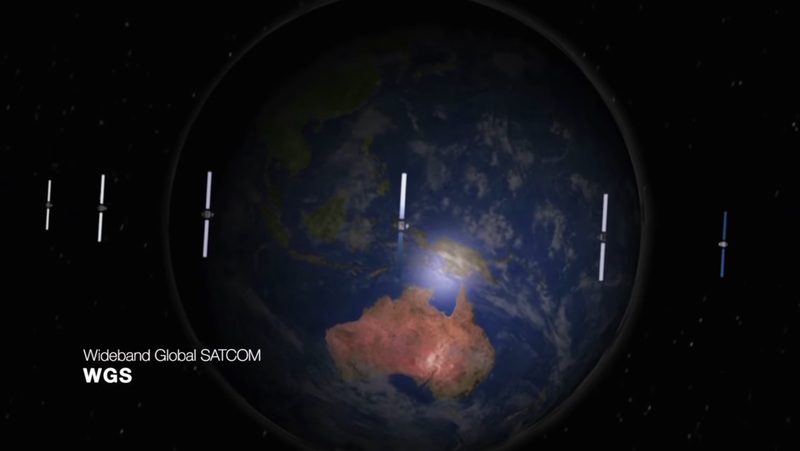 The Wideband Global Satcom (WGS) satellites build the backbone of U.S. military communications, providing encrypted and open communications in the form of video, voice and data connectivity to terminals on ships, jets, ground-based vehicles and communications packages carried by individual soldiers. Services supported by WGS include the vital exchange of tactical information & intelligence, delivery of battlefield maps and satellite images to troops, connectivity with unmanned drones and other operational communications as well as quality-of-life services such as TV distribution and E-Mail connectivity to deployed troops. WGS provides a tenfold increase of throughput capacity over the heritage geostationary communications systems and offers unprecedented networking flexibility through realtime frequency conversion. The WGS program was initiated back in 2001 as a follow-on to the Defense Satellite Communications System and Global Broadcast Service satellites – consolidating a pair of programs into a single system using state-of-the-art satellites deployed to Geostationary Orbit to realize a global communications infrastructure. Per the original plan, WGS was to consist of five satellites in Geostationary Orbit – four required for global coverage and one for coverage of high-demand areas or as orbital spare. 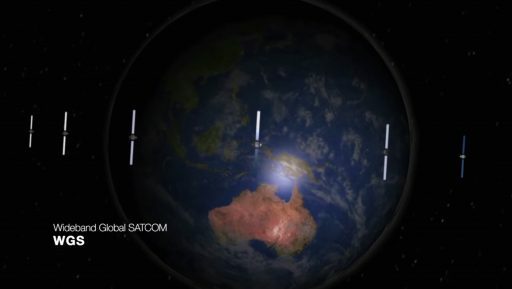 The program was expanded with WGS 6 ordered in 2007 by Australia, funding one additional satellite to get access to the global WGS constellation in return. The Pentagon later decided additional high-capacity satellites would be beneficial to the overall system, expanding the fully operational constellation to ten satellites and also inviting more international partners into the program. WGS 9 represents the second international contribution to the program as Canada, Denmark, the Netherlands, Luxembourg and New Zealand contributed the funds for the satellite in exchange for access to global bandwidth through the WGS constellation. 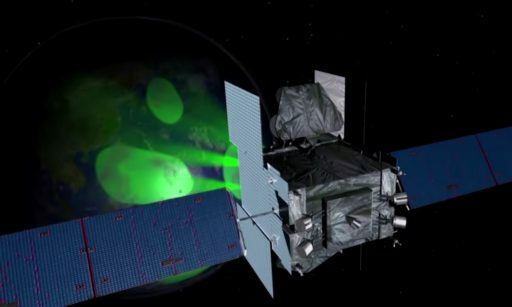 The $424 million spacecraft is the second in a series of improved Block II satellites that are the result of a gradual evolution of the Boeing-built WGS satellites and their throughput capacity. 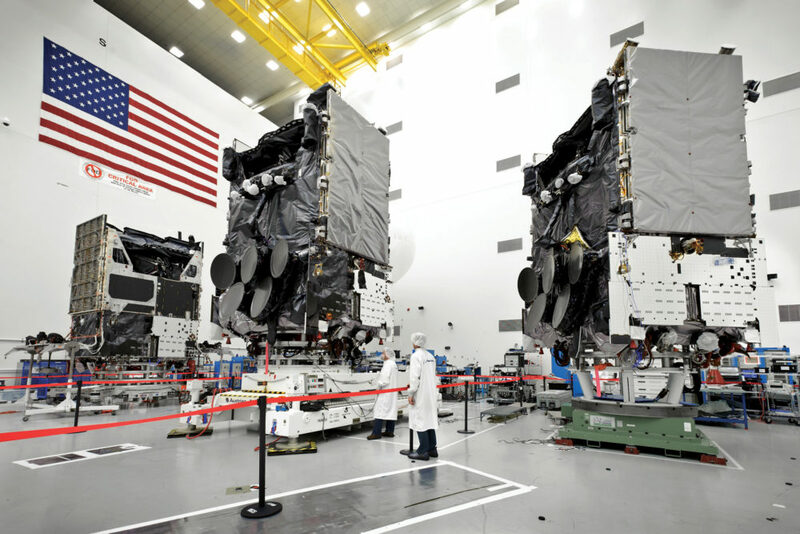 The first three WGS satellites, launched between 2007 and 2009, belong to the first generation and can support a data throughput of 2.1 to 3.6 Gigabits per second. 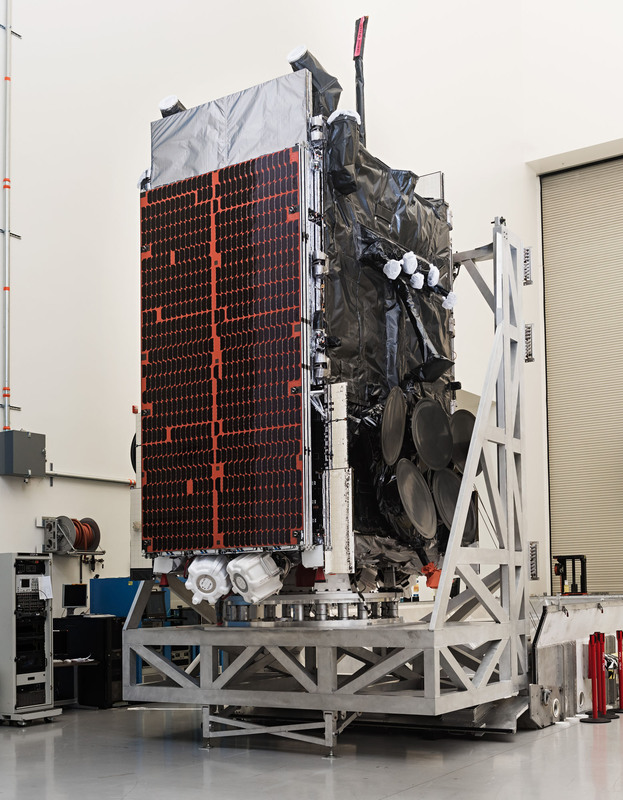 Four Block II satellites were launched starting in 2012, sporting upgraded electronics to support a data throughput of 6 Gbps and deliver optimized communications for the control of unmanned aerial vehicles that require high data rates and low-latency connectivity. The enhanced Block II was introduced with WGS 8 launched in December, featuring a Wideband Digital Channelizer at the heart of the satellite’s communications package to enable a data throughput of 11 Gbps. Based on Boeing’s popular 702HP satellite platform, each WGS satellite generates 19 communications beams – eight electronically shaped X-Band beams, ten Ka-Band beams provided by steerable antennas and a global broadcast beam in X-Band, allowing the satellite to deliver coverage where it is needed within its field of view by shaping or re-locating beams. The innovative channelizer is responsible for the realtime conversion of uplink and downlink signals between the different frequency bands. 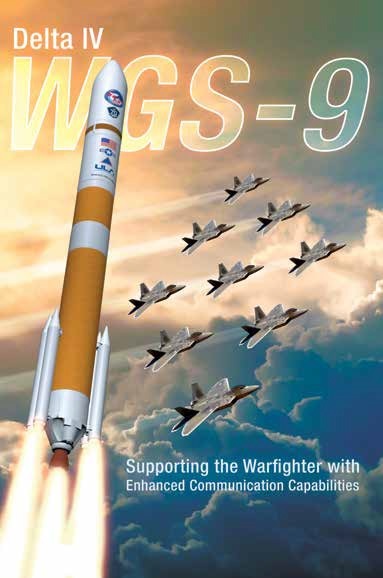 Weighing in at nearly six metric tons and targeting a Supersynchronous Transfer Orbit, WGS 9 required Delta IV to fly in its most-powerful single-stick variant, known as the Medium+ (5,4). This particular vehicle has flown six times before, all in support of WGS, and will be tasked with the completion of the constellation with the launch of WGS 10 in early 2019, also marking the end of Delta IV single-core missions in favor of ULA’s Atlas V and eventually the Vulcan launch vehicle. Saturday’s launch had the luxury of a nearly 100% GO forecast from the weather side as pristine conditions were expected for the 75-minute launch window with clear skies and calm winds. Delta IV was revealed eight hours head of liftoff when its 100-meter tall Mobile Service Tower was rolled to its launch position at a safe distance to the rocket, marking the start of final close outs of the launch facility to set up for propellant loading operations, picking up when the countdown resumed after the first built-in hold at T-4 hours and 15 minutes. Delta IV went through a series of systems tests, primarily focused on the Redundant Inertial Flight Control Assembly, RIFCA for short, building the brains of the rocket’s navigation and control system. Range controllers began overseeing clearance of the launch zone while Delta IV was being loaded with 230 metric tons of -183°C Liquid Oxygen and -253°C Liquid Hydrogen, consumed by both stages of the rocket. 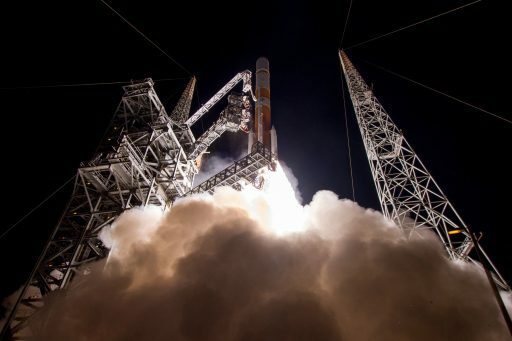 The two-hour tanking process was by the book and Delta IV was well behaved throughout the countdown, heading into final preparations that included uploading the appropriate flight software to the rocket’s computer and switching the satellite to battery power. The sun set at the Cape just as all 32 launch control stations went through their final status check to clear the rocket to press into its automatic countdown sequence. Although all stations provided a GO-report, Delta’s twilight launch turned into a nighttime liftoff when an alarm sounded just one minute before picking up the count, annunciating a potential problem with the swingarms extending from the Fixed Service Structure to the Delta IV rocket and tasked with a fast retraction at the moment of T-0. 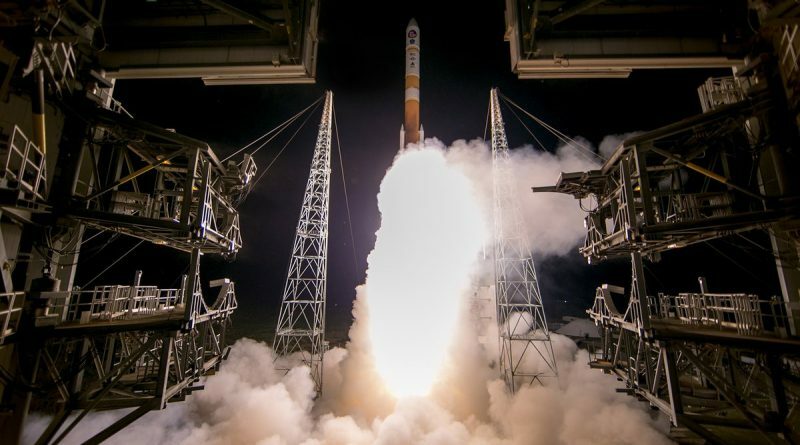 Engineering teams reviewed the alarm and cleared Delta IV to enter its automated countdown, covering the last critical reconfiguration steps to put the launch vehicle into a fully autonomous state for liftoff. The typical red flame of hydrogen erupted from the rocket’s base at T-5 seconds when the powerful RS-68A engine went though its carefully controlled ignition sequence to power up to a launch thrust of 320 metric-ton force. Upon ignition of the four boosters at 00:18:00 UTC, Delta IV catapulted off its sea-side launch pad with a thrust exceeding 750 metric-ton-force, creating a thrust to weight ratio near two – making for a very fast climb-out. Delta IV balanced in a vertical posture for only seven seconds before pitching and rolling onto an east-south-east departure path along a 93.5-degree azimuth, heading towards nightfall over the Atlantic Ocean. Burning propellant at a rate of 2,200 Kilograms per second, Delta IV accelerated from zero beyond the speed of sound in just over thirty seconds, encountering Maximum Dynamic Pressure at T+46 seconds. Each of the four boosters burned through 30 metric tons of propellant in a minute and a half to deliver the extra kick needed to send WGS-9 on its way. All four cleanly dropped away from the rocket one minute and 42 seconds into the flight, ensuring an off-shore impact. 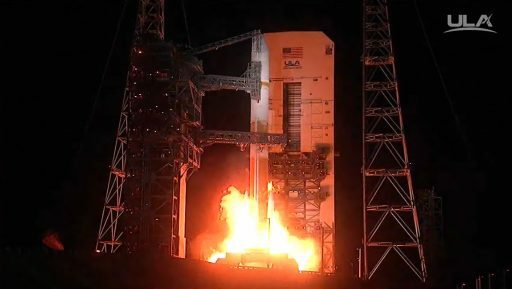 Within two minutes of launch, Delta IV had shed half its initial mass, powering towards an elliptical parking orbit with the RS-68A engine that generated a vacuum thrust of up to 363 metric-ton-force. Delta IV escaped the dense layers of the atmosphere and, at T+3 minutes and 16 seconds, split open and separated its two 14-meter long payload fairing halves, revealing the WGS 9 satellite for the rest of its high-speed orbital delivery. Delta 377 began a gradual throttle-back of its RS-68A engine to limit acceleration on the two-stage stack in advance of engine cutoff three minutes and 56 seconds into the mission. The 40.8-meter long Common Booster Core separated six seconds after MECO, pushed clear of the Delta Cryogenic Second Stage for the deployment of the RL-10B engine nozzle extension – a critical step in a fast-paced sequence setting up for engine start. RL-10B soared up thirteen seconds after staging, reaching its operational thrust level of 11,200 Kilogram-force to push the stack into orbit via a lengthy burn of 15 minutes and 37 seconds. 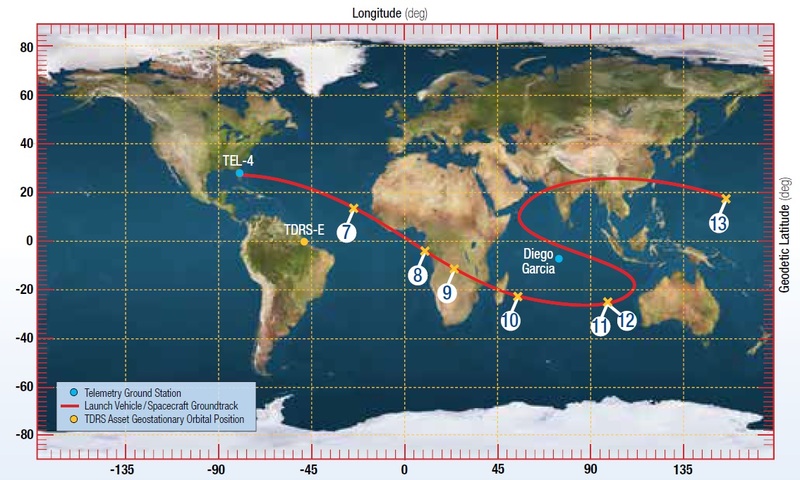 The first propulsive mission phase covered the majority of Delta’s trek across the Atlantic Ocean with shutdown marked just shy of the T+20-minute mark when the DCSS and WGS 9 arrived in a nominal transfer orbit of 185 by 6,085 Kilometers, inclined 27.6 degrees. Next was a brief coast phase of 9.5 minutes to allow the vehicle to progress towards the equator while also climbing in altitude so that the second burn could inject the satellite into a Supersynchronous Transfer Orbit with slightly elevated perigee. The vehicle’s ground track took it over Liberia and Sierra Leone followed by a pass over the Gulf of Guinea and sub-Saharan Africa where the second burn took place. RL-10B fired up 29 and a half minutes into the flight on the critical apogee-raising maneuver that was planned to take three minutes and nine seconds to push the stack into an orbit of 435 by 44,372 Kilometers at an inclination of 27 degrees. 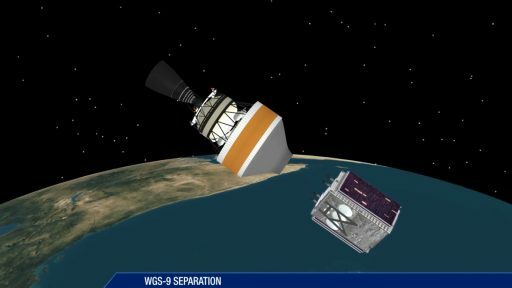 The burn was by the book and at its conclusion was another nine-minute coast phase that set up for the spring-loaded separation of the WGS 9 satellite 42 minutes after liftoff. Delta’s onboard navigation system showed the vehicle had achieved an orbit of 435 by 44,350 Kilometers, 27.00° degrees – marking a very precise orbital injection and Delta IV’s 34th successful mission. 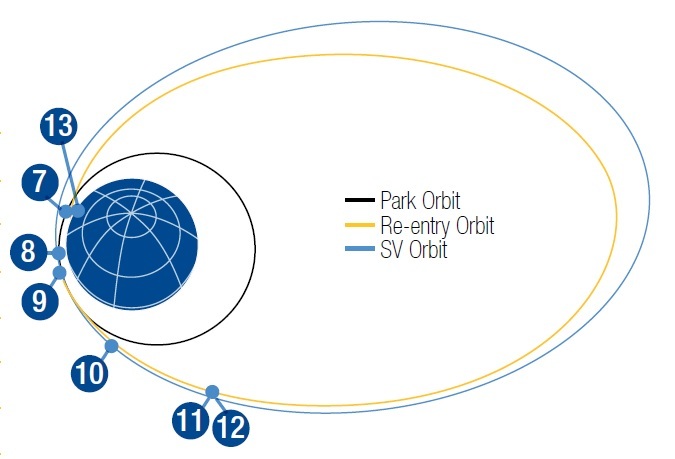 Beginning with the WGS 8 mission, the target orbit for the satellites was changed from a Supersynchronous Transfer Orbit with 65,000km apogee & 24° inclination to a slightly lower, higher-inclined orbit. This, coupled with the use of the more powerful RS-68A engine on the Delta IV, allows the DCSS to save sufficient propellants to remove itself from orbit. A space debris mitigation initiative by the U.S. Air Force calls for all military launches to leave no unnecessary debris in orbit, even it that means upgrading to a higher-performance launch vehicle to facilitate a deorbit maneuver. In case of WGS, it was decided that the marginally lower injection will have no effect on the satellite’s operational life and fuel supply. The DCSS was set for a ten-second retrograde burn of the RL-10B engine one hour and 12 minutes into the mission to slow down by around 180 meters per second and put the upper stage onto a trajectory intercepting the atmosphere after one lap around Earth. Destructive re-entry toward an impact in the Pacific Ocean is expected 12 hours after liftoff. Saturday night’s launch marked the 377th mission of a vehicle named Delta in a program dating back to 1960. It was the 35th flight of the Delta IV and the 3rd United Launch Alliance mission of 2017. 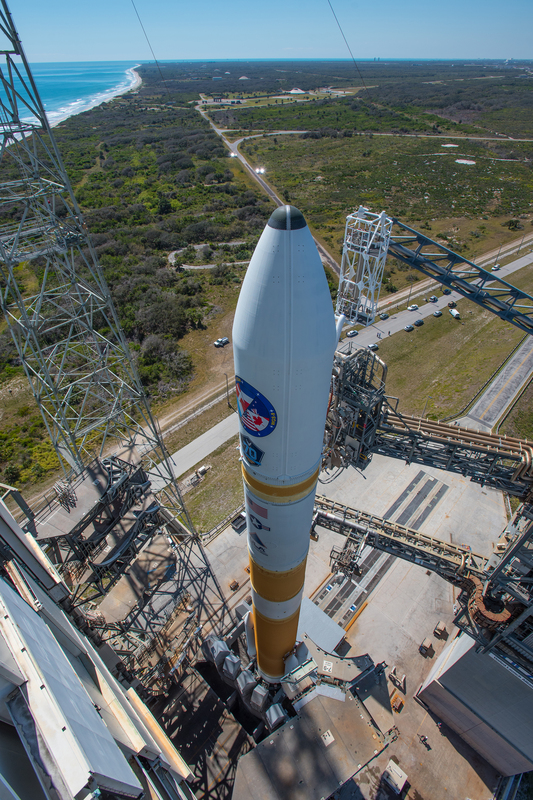 ULA’s next launch could come as early as the night of March 23 depending on range availability. This mission will involve an Atlas V launching the SS John Glenn, Orbital ATK’s seventh operational resupply mission to the International Space Station with the company’s Cygnus cargo craft. 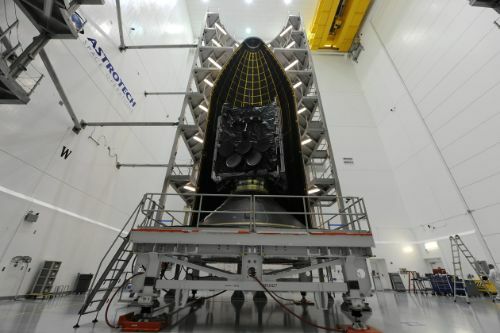 The next Delta IV launch is planned from Vandenberg Air Force Base in October with the classified NROL-47 payload.